Registration for the conference is free but mandatory. Please use the following adress to send your name, institute and mail adress. Lunches and a diner buffet will be covered by the conference. The registration for a financial support for students is closed. The selected students for the financial support will be notified very soon. The main objective of this event is to organise a winter school around stochastic and deterministic models arising in neuroscience by providing a series of lectures given by internationally reknown speakers for a broad audience (graduate students, PhD students, Postdoctorates, researchers and professors) along with specific research talks. 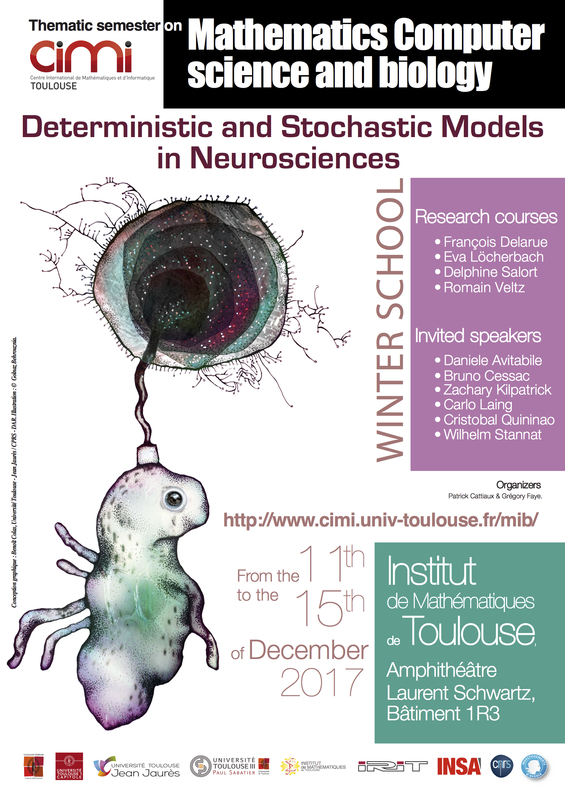 This winter school will showcase some recent and ongoing modeling problems in neuroscience with a strong emphasis on the stochastic and deterministic methods developped to treat them. There will be two lectures dedicated to stochastic methods and two for deterministic ones. The research talks will complement and enlarge these courses with for example topcis on neural field equations, numerical methods or kinetic models of neuronal networks. Here is the schedule and the program with abstracts of the lectures and talks (PDF).